To render the TreeView by using the DataSource, use the JSON data as shown in the following code. Then, map the attributes specified in the JSON DataSource to the corresponding properties in the TreeView fields. A TreeView cannot be built as follows, directly with this object. But, you can use a standardly serialized JSON object as follows to build a TreeView. You have to convert or format the above object into the required JSON format for building a TreeView. Once the JSON data source is formed, map the attributes accordingly, and then the Tree is created with the proper structure. Refer to the following code to build a TreeView from a perfectly serialized JSON object. //Perfectly created JSON that needs to be converted into TreeView. //Passes the standardly serialized JSON to the "CreateTree" function. //Initially creates the root level/parent node. //Converts the standardly serialized JSON to the required format necessary to form the TreeView. //While converting, creates the object for the tree with the required "ID",parentID,hasChild attributes. //Pushes the newly created JSON format to a new object. //Recursive function creates the sub nodes for the root element. 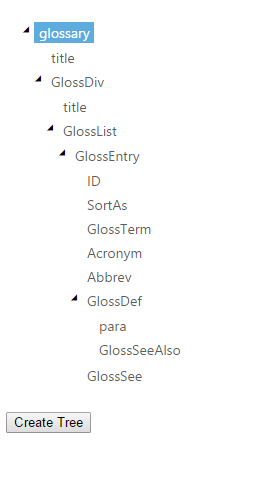 //While specifying the DataSource for the TreeView, the object that is newly formed from the standard JSON is specified. //Creates the Object for the Treeview.